A visit to Walt Disney World includes dining at some unique restaurants! In Epcot’s Germany pavilion, the Biergarten is more than a place to eat; it’s also an entertaining venue! Welcome back guest author Rebecca Dolan with a fun review. Everyone has a restaurant or two that, for them, make a trip to Disney World complete. For me, that’s Biergarten. This all-you-can-eat smorgasbord in Epcot’s Germany Pavilion is one of the few restaurants I insist on visiting nearly every time I’m in Orlando. 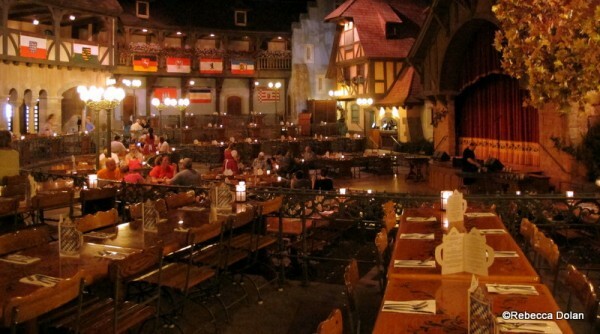 Like Rose and Crown, Biergarten was one of those places my mom made me eat as a kid and I hated it. But, now it’s one of the few places where I truly relish getting my meat and potatoes on. And, if you’re a meat and carbs kind of a guy/gal, then this is definitely the place for you! The back of the Germany Pavilion. 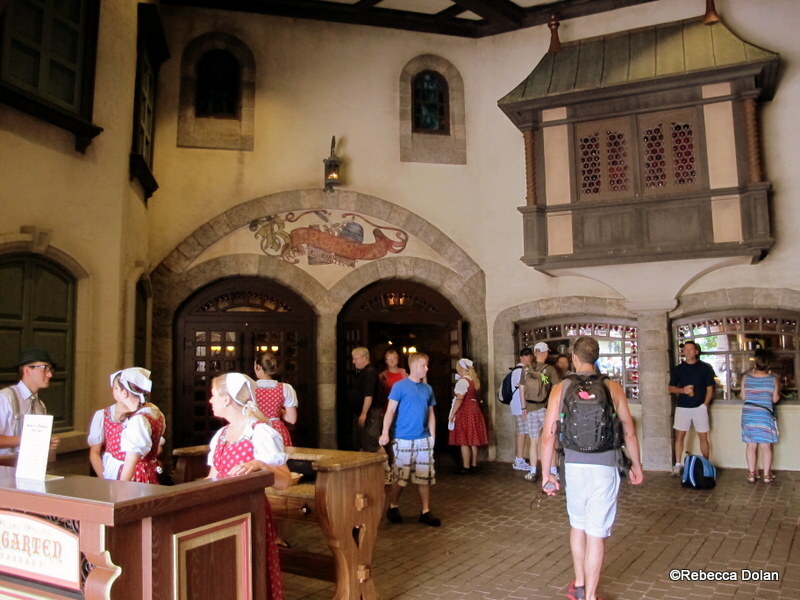 The Biergarten can be found at the back of the Germany Pavilion, under the big bell. The hostess stand is located outside, under the stone arch to the left. They’re a bit particular about how things are run here, and you won’t be allowed inside the restaurant until your name is called and your party is complete. Once you’re party is called, you’ll be shown in through these doors. Walking inside is actually like being transported back outside, as the cavernous restaurant is designed to look like an Oktoberfest celebration being held in a town square. A semicircle of Bavarian-style buildings, draped with flags of various German locales, arches around a central stage, while a full moon oversees the action. At least once during your seating, the stage will come alive with the sounds of a lederhosen-clad band that plays everything from alpine horns to polka. The band takes the stage. Make sure to bring your dancing shoes. It’s important to note that the party atmosphere comes complete with party-style seating. Each of the long, communal tables sits eight, so smaller parties will be combined. But, you’ll probably be too busy eating to chat anyway. The food at Biergarten is all served on a buffet, while the drinks are served by the German wait staff. Behind the semicircle of tables is the buffet, which consists of two entrée lines with a dessert station and a carving station between them. So, pick the shortest line; it’s all the same. 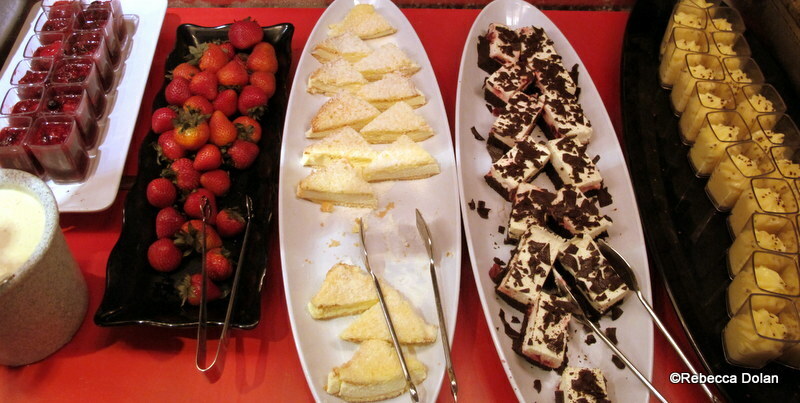 One of the buffet lines. At the beginning of the line are cold salads and meats, with options like cucumber dill salad, macaroni salad, potato salad, sausage salad, liverwurst, and sliced meat. Meats, etc. on cold buffet. Next comes the bread (read: unlimited hot soft pretzels!) and soup, which changes seasonally. On this trip the cream of asparagus was on offer. Get excited if you’re there on beer-cheese soup day. I’m going to be the one who says it: it’s way better than the one at Le Cellier. 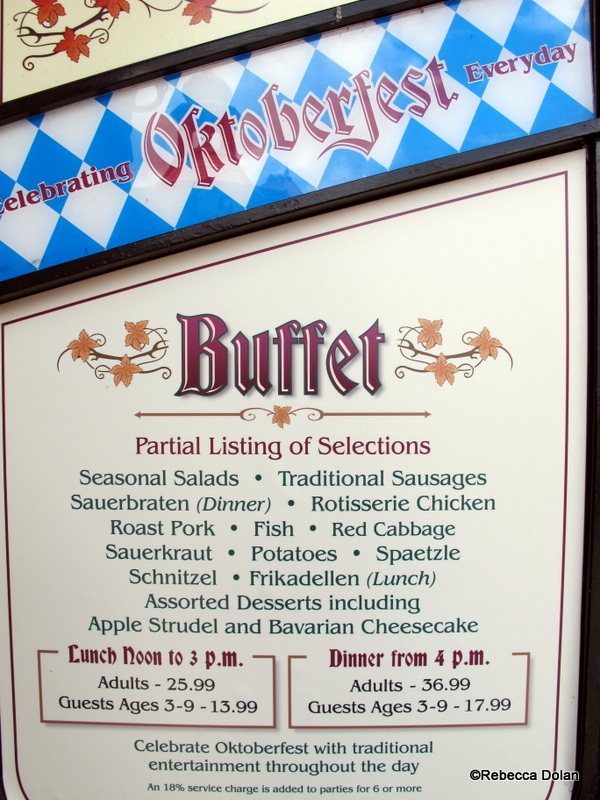 After the soup are the hot entrees, like rotisserie chicken, pork shank, sausages and sauerkraut, spaetzle, schnitzel, and German potato salad. I find that the spaetzle is best with Jager sauce, which sadly wasn’t on the buffet. But, the red wine and paprika sauces worked just fine. The kitchen was also testing out a chicken fricassee that day, which was nothing special. I wouldn’t be surprised if it doesn’t make it into permanent rotation. 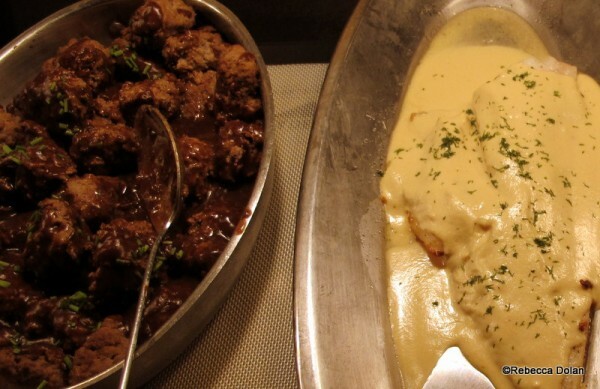 Roast chicken, meatballs, and pork schnitzel. Cod in cream sauce was the fish of the day. Spaetzle and red wine sauce. On the carving bar you’ll likely find German-style meatloaf and roast pork. But, the real stars of the carving station in my eyes are the bits of pork skin they keep to the side. They’re crunchy, salty, fatty, and utterly addictive. Nobody really seems to eat them, so, more for me! Meat loaf and pork on the carving station. 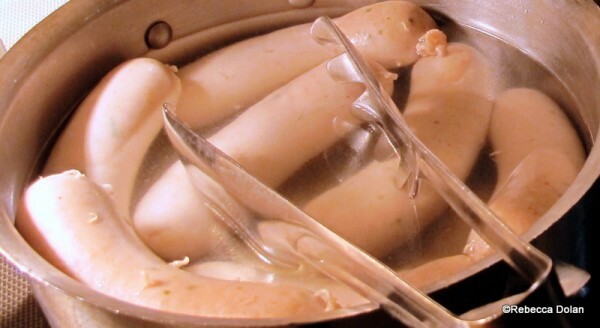 One of my favorite lunch-only dishes, veal sausages. Don’t miss the condiments lined up next to the meats. 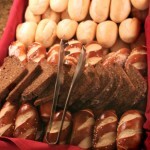 The sweet, whole-grain mustard is absolutely necessary for slathering on the pretzel rolls. 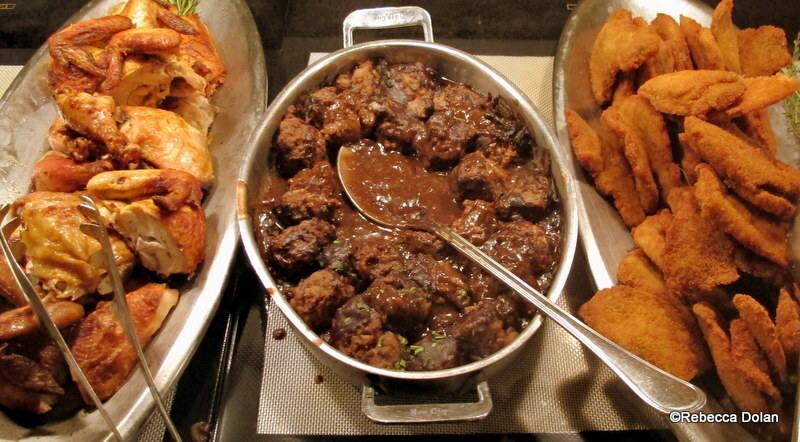 The lunch and dinner buffets are almost identical, with a couple different offerings available at dinner. 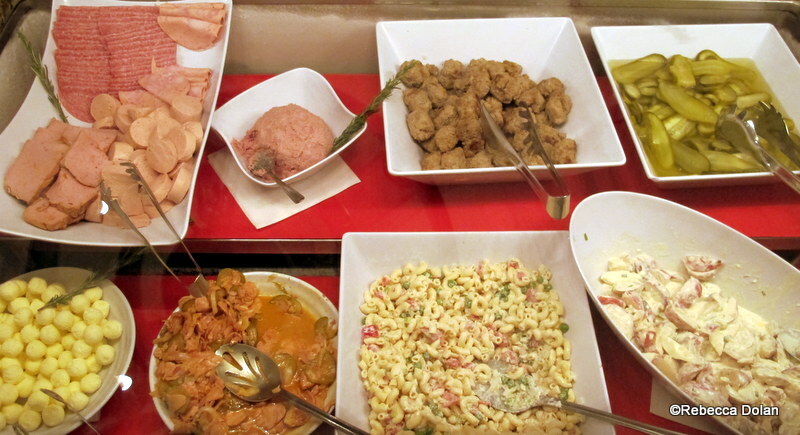 One particularly delicious item on the lunch buffet only is the cheesy spaetzle. Not entirely authentic, but tasty nonetheless. The only thing I don’t love about the Biergarten is dessert, which I find kind of underwhelming. I’d rather save room for a caramel apple from the Werther’s store — Karamell-Küche — at the pavilion’s entrance (or a funnel cake from The American Adventure). Berry compote with vanilla sauce, fresh strawberries, Bavarian cheesecake, Black Forest cake and vanilla pudding. Of course, this being Germany, having a beer is almost required. You can choose to have a half-liter, full liter, or a beer flight. There’s a nice selection of German wine, too, if beer isn’t your thing. On a previous visit our waiter insisted on us trying beer mixed with Coke, which is apparently a big thing in Germany. I asked about it this time, but this waitress insisted that was actually not the case; beer with lemonade is the thing to do. Taking her word for it I ordered one up, but it didn’t exactly knock my socks off. I’d still say it’s worth a try if you’re a beer fan, though. 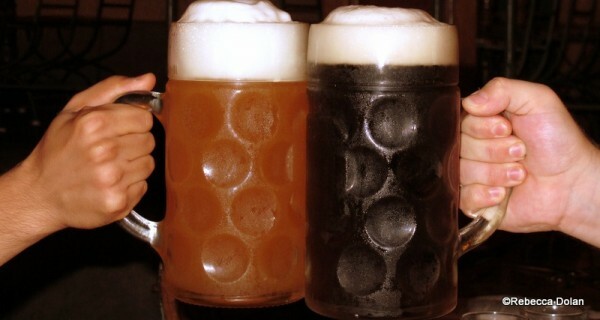 Liters of beer, with hands for scale! Sure, if you’re more of a salad eater, Biergarten’s probably not right for you. But, if you’re looking for hearty stick-to-your-ribs fare or a giant glass of beer, this is one of the best places on property to get it. Lots of it. What brings your family to the Biergarten? Will you try this restaurant on your next trip to Disney? Let us know in the comments below! « Review: “Best of the Fest” at the 2013 Epcot Food and Wine Festival Marketplace Booths! The cheesecake is the BEST cheesecake by far anywhere! 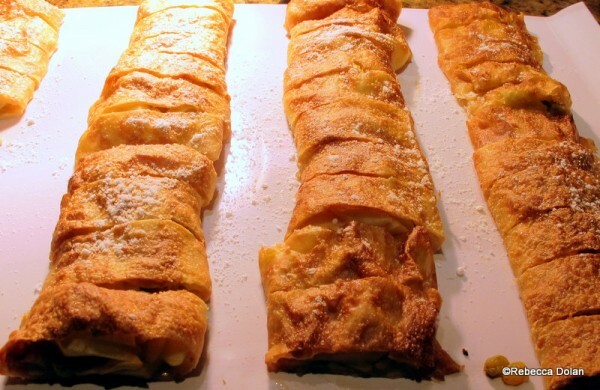 The apple strudel is also very good. And my daughter has to have the fruit compote. As you can see we do not agree with you about the dessert. We love Biergarten, it is a must do for us every trip. I like the old days when you could get ala cart or the buffet. 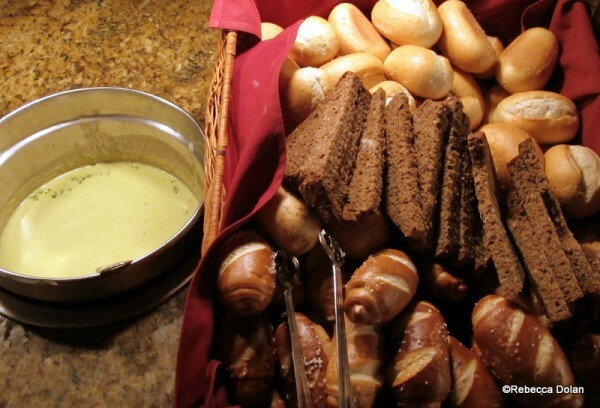 Loved the Veggie soup and pretzel. Yummy !! We haven’t eaten here in YEARS and we have a ADR for our trip next month !! Can’t wait !! My hubby LOVES this place. This great place is an absolute must-do on every trip! 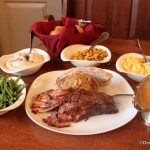 Delicious food, outstanding service, excellent entertainment and stellar value! The food was good, my 2 year old actually chowed on the soup (Cream of Asaparagas), which shocked us all…along with the pretzel rolls and mac&cheese. Beware with your seating times though. We had a 12:30 reservation at the beginning of September. We were seated immediately if not 10 minutes early and the first “show” was not until 1:30. As my 2 year old started to lose her patience with sitting and eating we decided that leaving sooner rather than later was in everyones best interest. We were not seated with another party as there were plenty of staff and tables available. We missed any sort of entertainment, which was disappointing. I’m sure if we stayed and hung out for another 15/20 minutes we would have caught something, but unfortunately, that was not in the cards. Biergarten is on our family’s to-do list almost every single trip. We’ve done lunch and dinner, and really much prefer it at lunch – where the menu is almost exactly the same, but cost substantially less. 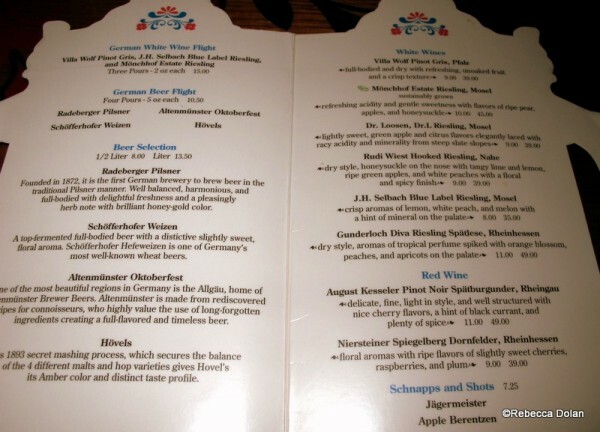 We usually schedule Biergarten for “arrival day” – so that our flight gets in, we go right to Epcot, walk around for a while, have a big “lunch” around 2pm, and then leave early to go get settled in our rental house. Protip – even if you really love beer (and I do), that second liter is ALWAYS a bad idea. Love, love, love the fruit compote! Fantastic drizzled with vanilla sauce. Last time I was there the waiter saw how much we enjoyed it and came out with a printed recipe for it, but not being any kind of cook, I didn’t keep it. That was very nice, though! We adore the Biergarten! On our last trip, we were seated right behind the dance area. It was so fun to watch the children dance! Being dedicated carnivores, we love the meats. On the dessert front, I could eat the fruit compote all day long. We used to love the Biergarten, but this last trip in the end of August was disappointing. First, we got there in time for our reservation, but had to wait over 40 minutes to be seated. They were having trouble with their pagers – they kept going off when they weren’t supposed to. They gave us at least 3 pagers. 🙁 We finally got in – hurray! There were actually different things on the two sides of the buffet. I “assumed” they were the same, but I was wrong. The desserts were good. We enjoyed the food, and the people at our table were all very nice, and friendly. The show was what was really disappointing. 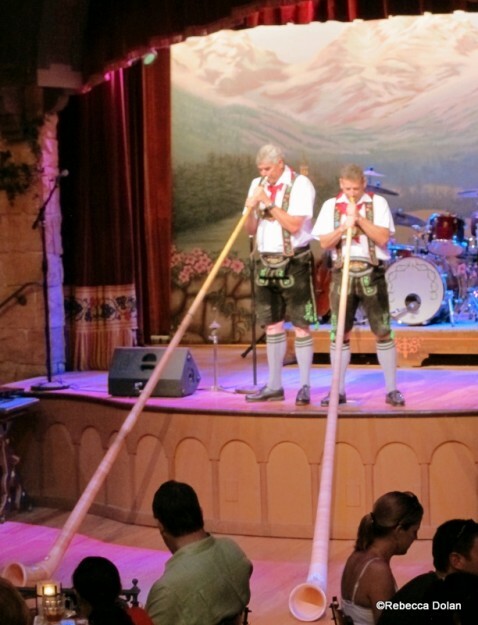 No Alpen horns, no bells, no slap dancing, no yodeling. Just the chicken dance (Is that even German? 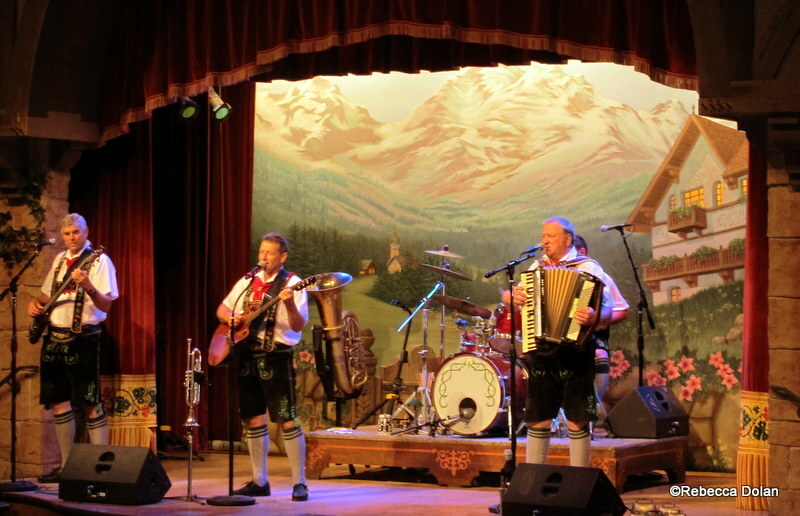 ), a few other instrumental songs, the Hofbrau house song, and the ticky-tacky thing. Nothing at all like our previous visits. They could have played a recording! It was our 12 year old niece’s first visit to WDW, and we tried to take her places that were really fun. I must say, the cucumber salad and the rote kohl were the best! Absolutely yummy. The only things I wasn’t crazy about were the schnitzel (a bit dry) and the paprika sauce (which I put on the schnitzel, but didn’t much like the taste. I wish they still had the musicians in the courtyard, like in the old days. I agree with Ann G. I love the desserts there too! The cheesecake is fantastic, and the berry compote is called Rote Grueze in German. It is a specialty of the Berlin area in particular. LOVE the stuff and it’s so hard to find here! Loved your review though and the photos are fantastic. I can’t wait to get there at the end of this month!!! Glad you brought that up, Melissa. It’s actually important to note that the latest seating times don’t always come with a show, as they are after the last performance of the night. We found that out the hard way. During our most recent visit here, we mentioned that our daughter, who is eleven, was a vegetarian. The waitress brought one of the chefs back to our table and he gave us a tour of the buffet and discussed in detail what she could and couldn’t eat given her dietary restrictions. That is killer service! 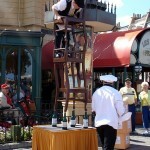 This is, IMHO the best meal/entertainment value in all of Disney World. 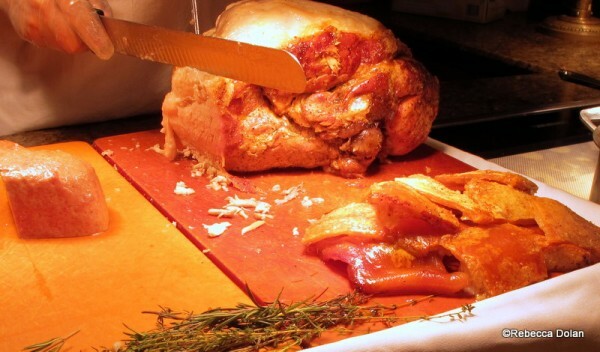 The food quality is very good, the atmosphere wonderful and the entertainment is enjoyable. I agree with everyone that Lunch is the best time to go, the menu really isn’t much different than dinner. I disagree with John on the 2nd Beer though 😉 My daughter and I will be there on Friday! We have ADRs for our trip in Nov. Anybody know what the kids selection is like? I’ve always liked the sound of Biergarten but my husband isn’t keen on the communal seating style. Maybe I’ll get him there some time soon! Oh and, in the UK, beer mixed with lemonade is called shandy, though it can be mixed with any carbonated drink to be honest. Its lovely on a summer’s day! Melissa, that is a bummer. Thanks for the tip. I knew if you got in too late in the evening you missed the entertainment. I didn’t realize it didn’t start until 1:30, which is 2 hours after they start seating for lunch. Certainly something you’ll want to ask when making an advance dining reservation (ADR). I have to agree with Rebecca on the deserts, not what I go to the Biergarten for, but glad to see there are lots of you that enjoy the dessert fare. Cheryl, I have been there when they do not do the horns and/or the bells, but never both. That’s a bummer. I wonder if they had a glitch that evening. I don’t remember the last time they yodeled. Do you, Rebecca? And like John said, “even if you really love beer (and I do), that second liter is ALWAYS a bad idea.” Just ask my son, although he probably won’t even remember. 1. I find that Biergarten is actually a very GOOD place to eat for salads and veggies. After a week of eating at rich restaurants like California Grill, Flying Fish or Le Cellier, which all have very appetizing menus, where I won’t “waste” my first course on ordering a salad, it’s a very nice change to go to any buffet and force yourself to only have salads for the first course. 2. Don’t feel obligated to drink your beer. At the end of our first visit, I had about one quarter of my liter of beer left. We had to leave so we could catch Illuminations, but I didn’t feel like chugging the rest of the beer. The waiter offered to put the rest in a “to-go” cup. We laughed, assuming that he was joking. HE WASN’T JOKING! He put the rest of my beer into a paper cup (like they use for sodas), and I was allowed to walk out and sip while we watched the fireworks! 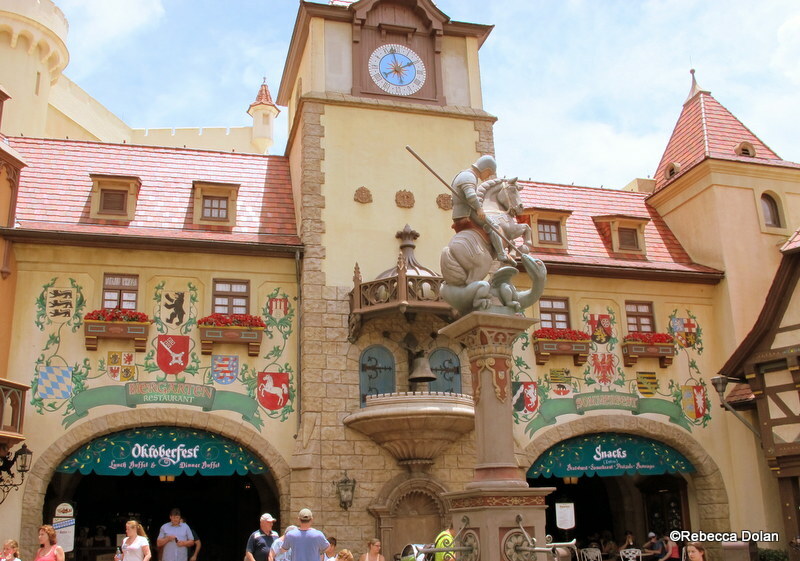 We regard the strudel at Biergarten as one of the best desserts at WDW. He’s looking forward to another piece on our next trip. 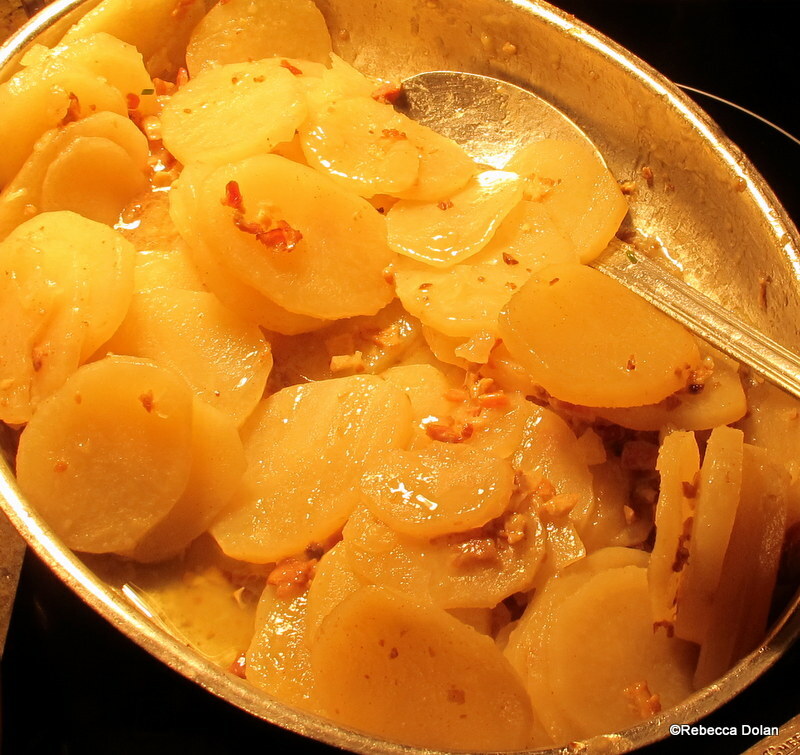 My husband lived in Germany as a child, and he thought the food was pretty decent, similar to the cooking he had while there. It took a long time to get him to go to Biergarten, as he didn’t want to sit at a communal table. But the way we were seated, it didn’t feel as though we were sharing a table–and the people next to us turned out to live 40 miles away from us in Virginia! Our fussy eater son managed with roast chicken and a lot of pretzel rolls, plus a couple of helpings of vanilla pudding with chocolate chips. I’m a primarily vegetarian eater, and I thought there was plenty for me. Lots of salads, plus the absolute best spaetzle ever. Add beer and that great strudel and I was set. And yes, lemonade (or soda) plus beer equals a shandy. Popular bar drink in England too. @Nikki — I don’t recall Biergarten ever really having a kids’ menu area. Whenever I’ve gone for dinner there has been macaroni and cheese, but from what I can remember that’s about it. There are a handful of “plain” options on the regular buffet like hot dogs, rotisserie chicken, roasted potatoes, spaetzle (which are just plain noodles), potato dumplings, roasted pork and vegetables (carrots?). @ Lisa — You’re right. I can’t remember the last time they yodeled. Thanks, Rebecca! That sounds “do-able” for my son. As long as there’s mac and cheese, he’s a happy dude. Can’t wait to try it out come November! Just ate here last week, its a must on all our trips. It took me so long to try it because I can’t stand the smell of sauerkraut but I don’t even notice it once I get all I can eat spaetzle! There is plenty to eat for everyone (including my 16 month old niece). The show is also fun to see while eating. 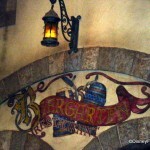 Biergarten was by far our favorite TS from our last trip. My boyfriend loved the pork at the cavery (especially the crackly skins! ), pork schnitzel, roast potatoes, and pretzel rolls. He must have had 5 of those rolls! I thought the nudel gratin (fancy mac and cheese), sauerbraten, beef roulade, and potato dumplings were outstanding. We both enjoyed the apple strudel. This is definitely a MUST REPEAT for our next trip. We’re locals with annual passes and have always loved the Biergarten, mostly because of the great atmosphere and entertainment. It’s a nice break from the crowds and a chance to have a relaxing meal and keep the kiddos entertained. 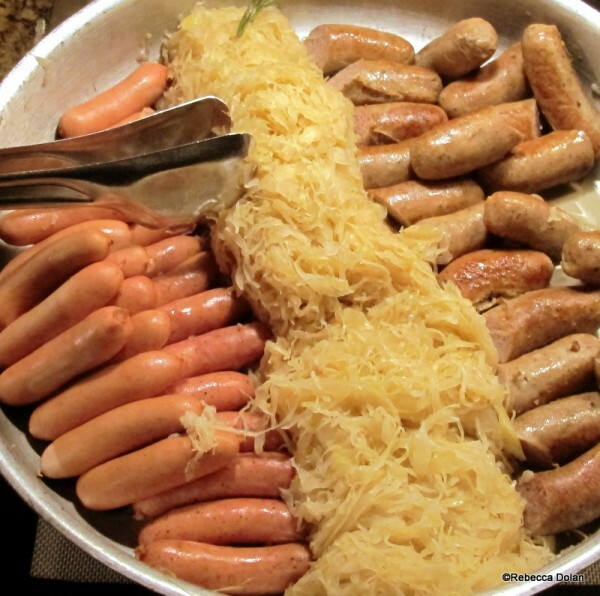 I’m originally from Milwaukee, a city with some amazing German restaurants, so I’ve never been overly impressed with the food at the Biergarten. In the past, for me, it’s just been okay. BUT, we recently dined here again during the Food & Garden Festival, and I noticed the food had really improved. I even mentioned it to the server and she said that they had improved on their recipes (ex=the schnitzel is now made with pork, not chicken like in the past). I was impressed! It’s a great buffet with a great variety and should not be missed! 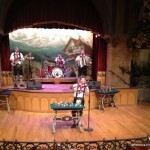 Visited the Biergarten for dinner April 13. It was the worst excuse for German food I have ever experienced. What was supposed to be sauerbraten was leftover beef with a nondescript gravy. The food looked as though it had been on the buffet all day. We paid $37.99 each. Highway robbery for such inferior food. I’m on a hunt for the beer-cheese soup recipe and one of my google searches brought me to this page. Sadly, it is not here. 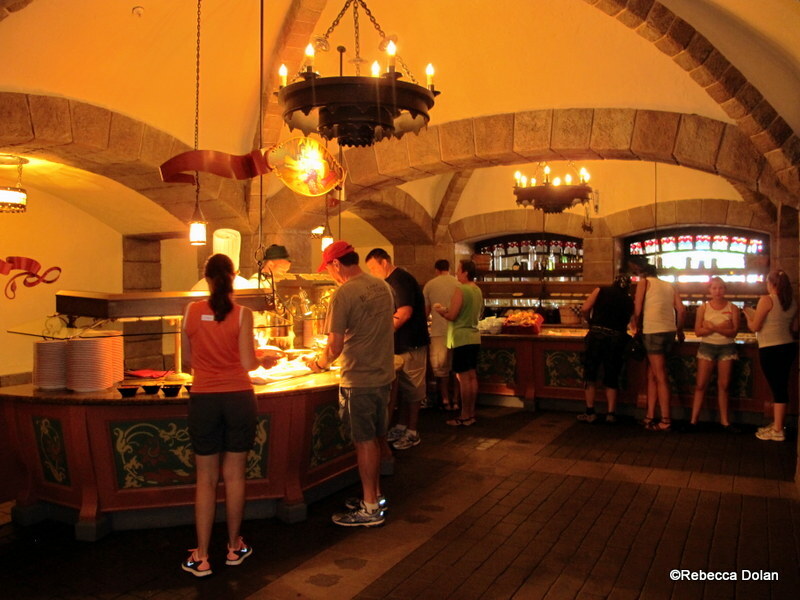 We just returned from our trip and the whole family loved the Biergarten buffet. 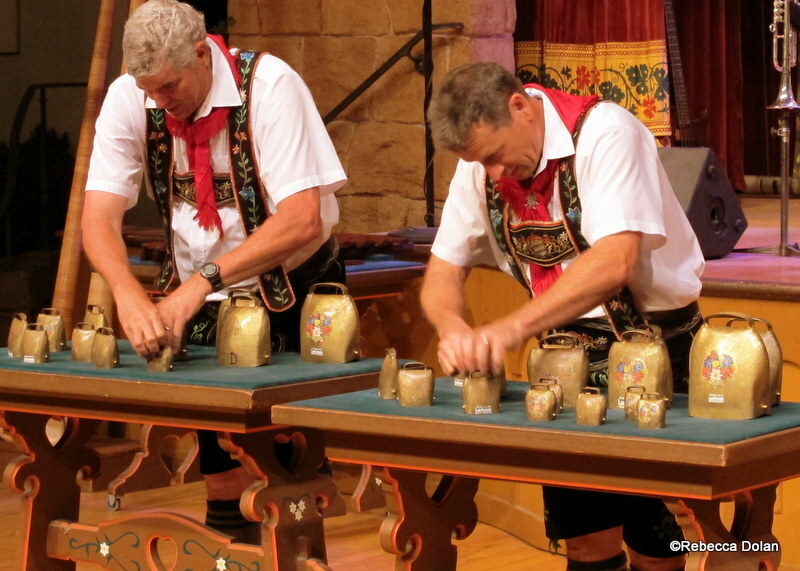 Not sure when our next trip back to WDW will be but the Biergarten will definitely be on our do-again list. Now, if I can just find the recipe for the beer-cheese soup, perhaps that will tide me over in the meantime. Laurie S. — While we haven’t published a recipe for the Beer Cheese Soup at Germany’s Biergarten, a guest author did write a post featuring the Canadian Cheddar Cheese Soup (which also has beer in it) from Le Cellier and the Canada Marketplace during the Epcot Food and Wine Festival. Also, we’ll add your request to the Recipes Wanted Page. So glad you found DFB — thanks for reading!! My family and I are frequent flyers at WDW. We do Epcot every year, my favorite part of the week actually. We have yet to venture in to Biergarten. We keep saying we will, but it never happens. Some people swear that a certain day of the week is the quietest and best time, but I want loud, fun, drunk and belly-filled. I guess my question is, is there a bad time to go? We would prefer lunch, a noon to 3pm kinda thing. Atleast I can walk around for a few hours to sober up. Looking for as much feedback as possible. I will check in here periodically. Thanks!